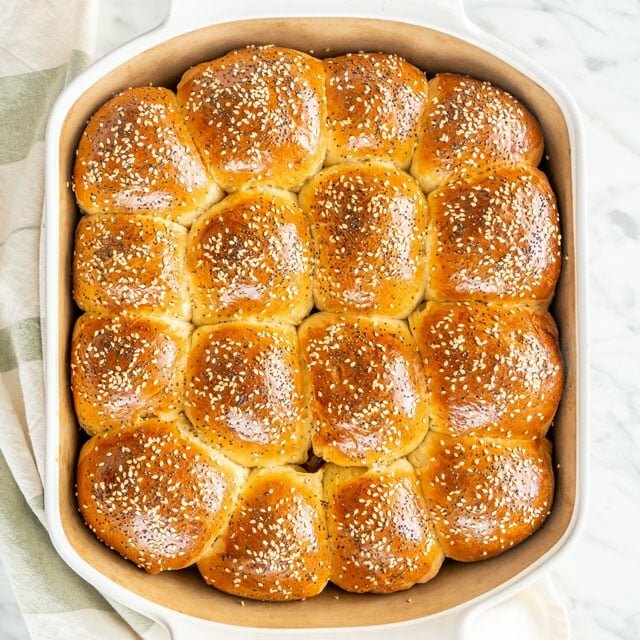 These Dinner Rolls are soft, fluffy, and buttery, a classic no fail recipe that requires very little effort to make. The perfect addition to any meal! This is a classic recipe that I’ve been making for many years! This recipe has been in my cooking/baking repertoire for at least a couple decades which is why I say it truly is a no fail recipe. Every single time I make these, I end up with gorgeous dinner rolls. They’re so good that most of the time they don’t even last until the next day. There truly is nothing better than homemade dinner rolls. The smell in your house is divine, not to mention that when you pull these babies out of the oven, the satisfaction you get is worth the effort. However, very little effort is required for these dinner rolls. If using active dry yeast, activate the yeast first. You can also use instant yeast, and if doing so, you do no need to activate it. Just add it to the rest of the ingredients. Please note that the amounts of the ingredients don’t change. To activate the yeast mix it with a bit of sugar and warm milk. Give it a little stir and let it rest for 10 to 15 minutes, until it starts to froth up. See notes on yeast in the recipe card for more information. Add the rest of the ingredients to the bowl of your mixer and mix until the dough comes together and is pulling away clean from the sides of your bowl. The dough will be a little sticky, but not too much. I usually let the dough rise right in the bowl of my mixer. Just cover it with a damp towel or plastic wrap and let it rest in a warm environment until doubled in size. Once the dough has doubled in size, punch it down with your fist to deflate it a bit, then divide it into 16 equal size pieces. Shape it into rolls (watch video to see how) and place them into a baking dish. Cover the baking dish with plastic wrap and let the rolls rise a second time until doubled in size. It should take another 30 minutes or so. I like to brush my rolls with a bit of egg to make them nice and shiny then sprinkle them with seeds such as poppy or sesame seeds. However, you can also brush the rolls with some melted butter. Bake the rolls in a preheated oven for about 30 minutes at 375 F degrees or until golden brown. No mixer, no problem. All you have to do is knead everything by hand. After you proof the yeast as instructed, if using active dry yeast, just add the rest of the ingredients to a large bowl and start by stirring everything with a wooden spoon until you can’t do it anymore. Transfer the dough to a clean work surface and knead by hand until all the flour is incorporated and you end up with a dough that is slightly sticky but soft to the touch. Absolutely! It will even make your job easier since no proofing is required. That is basically the only difference between instant yeast and active dry yeast, no proofing required. Simply add the yeast to the rest of the ingredients and mix. Yes, you still need to add the milk, since that is most of your wet ingredients. I’ve said this many times before but I’ll say it again and again and again. The secret to making great bread or dinner rolls is the yeast. If using active dry yeast, always make sure you proof the yeast first. This means that you’re proving that your yeast is alive. You usually proof it with warm water or milk, and sugar. When these 3 ingredients are combined, the yeast starts emitting bubbles of carbon dioxide. If your yeast doesn’t bubble up, do not continue with the recipe. Your bread or rolls will turn into a brick, it will not rise at all and it will all be a waste of ingredients. Also make sure that your water or milk is not too hot, if it’s over 140 F degrees, the yeast will die, which kind of defeats the purpose of proofing the yeast. The ideal temperature of the milk or water should be between 100-110F degrees. Resist the urge to add more flour to the dough, even if the dough seems sticky. Usually the ratio of flour to water is 2:1, so in this case if you add up all the wet ingredients together, you will get to that same ratio. While adding more flour will make the dough less sticky, you could end up with denser bread or rolls. 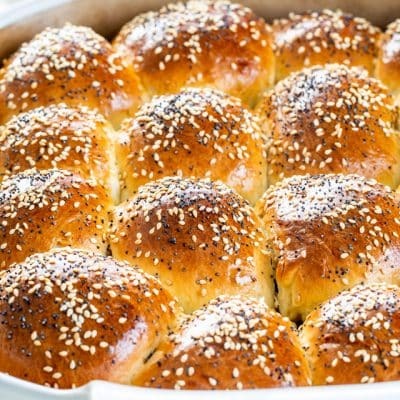 While these rolls can be made “no knead” by just dumping all of the ingredients in a bowl and stirring them, the purpose of kneading is to develop gluten. By developing this gluten, your dough will rise nicely and you’ll end up with gorgeous high rolls instead of dense ones. Let your dough rise in a warm draft free environment. I always warm up my oven first till it reaches 200 F degrees, shut off the oven then place the bowl with the dough in there. Not only is this a draft free environment for your dough, but because of the heat it also speeds up the rising process and in around 30 minutes, your dough should have doubled in size. Most doughs require two rises. The first in the bowl and the second after shaping. 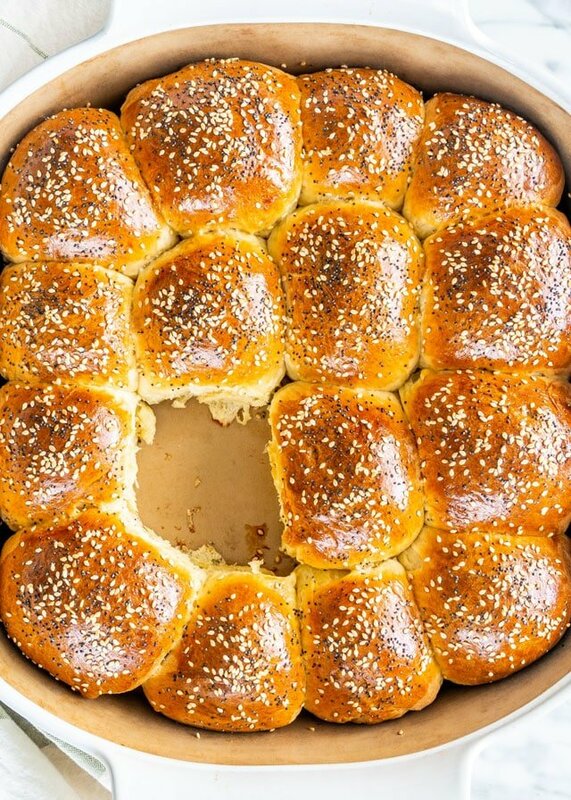 These rolls can be made the night before up until you shape them and place them in a baking pan. You can then cover them and place them in the fridge overnight. The rolls will continue to rise in the fridge but at a slower pace. The next morning, simply take them out from the fridge and let them come to room temperature before baking. To get that nice golden, shiny top, brush your rolls with egg white or butter. Also, don’t be afraid to top them with your favorite seeds, such as poppy seeds, pepitas, sesame seeds, sunflower seeds, chia seeds, etc. Let the rolls cool completely. I usually place them on a cooling rack, and let them rest there until they come to room temperature, should take a couple hours. Wrap each roll in plastic wrap, tightly all around. If you use a plastic storage bag, push out all the excess air from inside, the air will dry the bread quicker. You can keep them at room temperature for 2 to 3 days. If you refrigerate them, they will dry out at a faster rate. 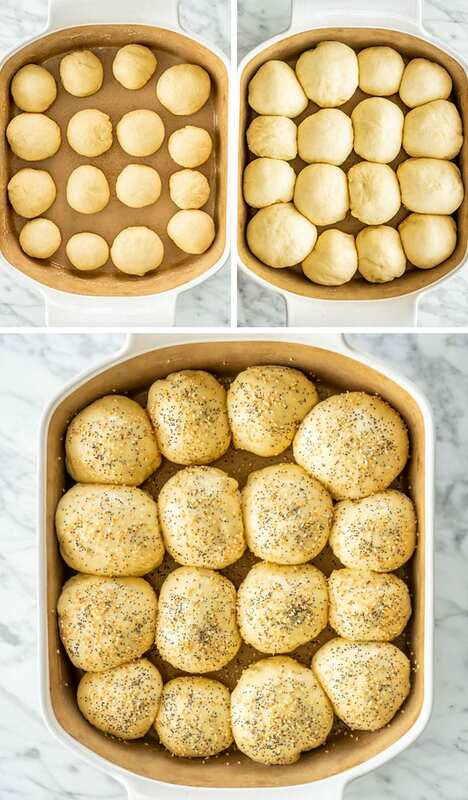 If you’re lucky enough to have some leftover dinner rolls, you can freeze them. 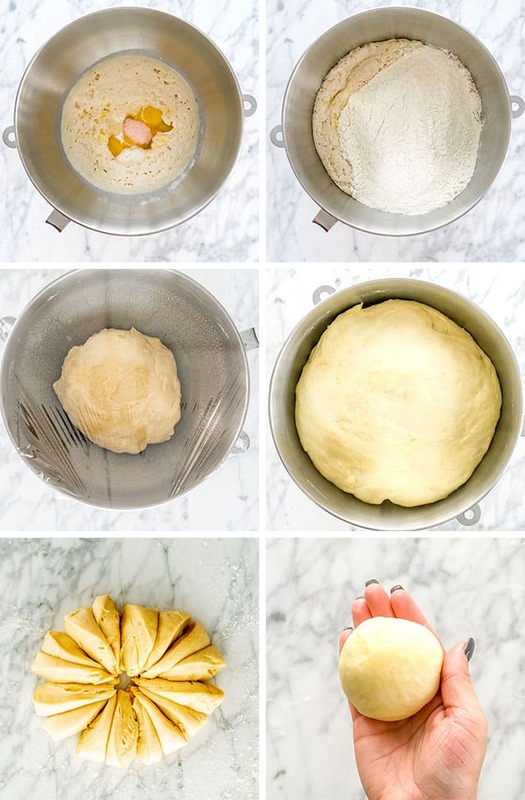 Make the dough then shape them into rolls immediately. Do not let the dough rise. Place the rolls on a baking sheet lined with parchment or wax paper. Cover the pan with plastic wrap and place the pan in the freezer. Leave them in the freezer until the freeze solid and are rock hard. Take the baking sheet out, place them in a freezer bag and back in the freezer they go. They should last about 2 weeks. 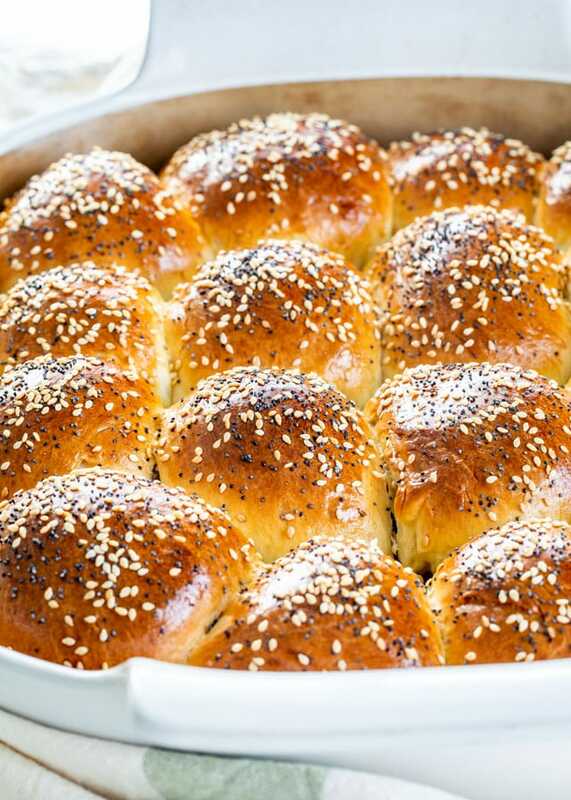 The day you want to serve them, place the frozen rolls on a baking sheet. Cover the pan and let them rise. Speed up the process by placing them in a warm oven. I usually preheat my oven to the lowest setting, then turn it off and let me dough rise in there, all nice and warm. Once the rolls have doubled in size, brush them with egg or butter, top them with seeds if preferred and bake as instructed. Bake the rolls as instructed. Let them cool completely in the pan, then wrap them tightly with aluminum foil. Do not use plastic wrap as it will make the rolls soggy. Place the foil-wrapped pan in a freezer bag or storage container. Place them in the freezer and store them for up to 3 weeks. I wouldn’t keep them longer than that, as they might start to develop frost and freezer burn. To thaw the dinner rolls, remove the rolls from the freezer the night before you want to serve them. Remove the foil-wrapped rolls out of the freezer bag or storage container and let them thaw at room temperature overnight. You can serve them like this, but I prefer to reheat them in the oven for about 10 minutes at 300 F degrees. 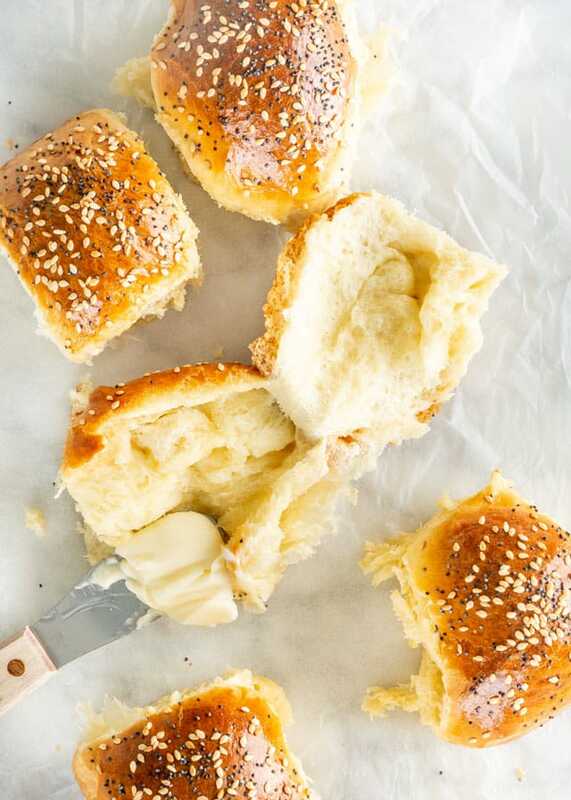 These Dinner Rolls are soft, fluffy, and buttery, a classic no fail recipe that requires very little effort to make. The perfect addition to any meal! Activate yeast: To the bowl of your mixer add the yeast, the 1 tbsp of sugar and the warm milk. Gently whisk it all together and allow it to rest for 10 to 15 minutes. After this time, if the yeast is good, it will froth. Make dough: Add the butter, sugar, egg yolks, salt, and flour to the yeast mixture. Mix with the dough hook on low speed, until it's all incorporated. Increase to medium high speed and knead for another 5 minutes. The dough should be slightly sticky but still soft to the touch. First rise: Place the dough in a lightly greased bowl, or the bowl from your mixer and cover it with plastic wrap. Let it rise until it doubles in size, about 45 minutes to an hour. See notes for rising. Prepare baking dish: I normally use a 9x13 inch baking dish for these, so lightly grease your baking dish with cooking spray or butter. Form rolls: Dust your work surface with a little flour, place the dough then press it down so that it deflates. Shape it into a ball. No need for additional kneading. Divide the dough in 16 equal pieces. To shape each piece into a roll, take a piece and flatten it with your palm or fingers. Fold it up into a ball by pinching the sides together, turn it over and roll it briefly. See video. Place the roll with the smooth side up onto the prepared baking sheet. Repeat with remaining dough pieces. Second rise: Cover the pan with plastic wrap or a clean kitchen towel and let the dough rise again until it's doubled in size, another 30 minutes or so. Prepare oven: Preheat the oven to 375 F degrees. Brush rolls with eggs: Remove the plastic wrap or kitchen towel and brush the rolls with the egg white, so that they end up nice and shiny. Sprinkle with poppy seeds or sesame seeds, if preferred. Bake: Bake the rolls for 30 minutes or until golden brown. Excellent !!! Fast and delicious. A rare combination. Made this for dinner tonight. Will be making many time more. Thanks. Followed directions as given and voila! Perfect! My husband loves them as do l! Only had to bake them for 20 minutes. I’m going to try the Parker house rolls now. By the way, this is my favorite cooking website. Thanks Jo. Tried this last night and was delighted with results- looked just like the pictures. Thought it was too sticky but as instructed resisted the urge to add more flour .Did not have a baking tin the correct size so put the dough in an old lasagna dish with fingers crossed. I’m so happy they turned out for you, Chryl! I am looking forward to trying some of your bread recipes. In the UK we usually use strong bread flour which has a higher gluten content than plain flour(your all purpose ) Which do you suggest I use? For this recipe we used all purpose flour- we also have a bread flour available in Canada, but we find that all purpose works just as well for these recipes. You can definitely make all the dough at once, you’ll just need two separate pans. I’m going to try this recipe in my bread machine/dough cycle which will take it through the first rise unless you do not recommend doing that? How long does it usually take for the 1st rise in your bread maker? If you let it rise in a warm oven (100F) the process will be quite fast. The entire process of mixing, kneading and first rise takes about an hour in the bread machine. I’ll give it a try and let you all know how it turns out. I love to cook but rarely bake. today I wanted fresh buns to go with my soup for lunch and this is the recipe I chose. The dough looks great and is rising. They will be ready to eat in a few hours. I can hardly wait. Hi Conrad, so glad you chose my recipe, I’m sure you’ll love these rolls, they’re delicious! Once you add the egg yolks into the milk mixture and dry ingredients, don’t the eggs start to cook because you’ve added it to hot milk? The eggs won’t cook because the milk is not hot, it should just be lukewarm, between 100 and 110 degrees, warm to the touch. After step 4, can I refrigerate it and bake it the next day? Do I need to bring it to room temperature before I bake? Yes, I would bring it to room temperature before baking.